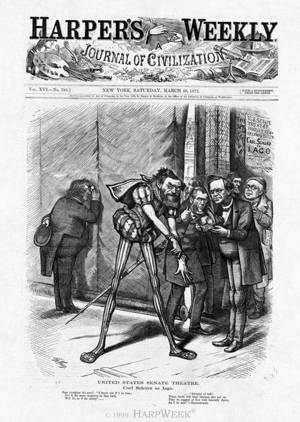 Two weeks after publication of “The ‘Liberal’ Conspirators,” the same group of anti-Grant Republicans reappears supporting Senator Carl Schurz as he studies for the role of the duplicitous Iago in the “United States Senate Theatre.” Senator Charles Sumner checks the house. Schurz prepares for dark mischief with a pair of scattered and unrelated quotes from Shakespeare’s Othello. Senator Lyman Trumbull holds the costume crown, which receives the thumb’s-up sign from Senator Thomas Tipton. Behind Trumbull, Greeley looks at Schurz admiringly, while the editor’s coat pocket is stuffed with a paper reading, “What I Know About Carl.” In the background are Senator Reuben Fenton and Senator John Logan peeking at the audience.